Arestless crowd outside an auditorium seems quite out of place at Wai. The lush green temple town at the foothills of Panchgani in Maharashtra is used to prayer-chanting pilgrim throngs. But at Chitra Talkies it is a cacophony of wolf whistles. The crowds get more raucous when the amplifiers inside belt out music punctuated by a woman’s moans and gasps. At the national selection trials of the 64th Mr World and 44th Mr Universe, seventyodd body builders are flexing muscles to sleazy numbers. Backstage they polished their bodies in much the same way we polish shoes. Called “dream tan” in bodybuilding lingo, the cream makes their shoulder blades glisten, highlights the bulge of biceps and brings out the undulations of the six packs. Sporting trunk No 30 is Kamaraj. A veteran in professional bodybuilding, Kamaraj was a nimble-footed kabaddi player from a small village in Tuticorin district of Tamil Nadu when he joined a gym at his brother’s insistence. There he saw a half torn poster of Arnold Schwarzenegger and Kamraj had found his idol. He went on to join the army, won the Mr India title three times and played anti-hero in a small budget Tamil film Dhairiyam. The 32-year-old works out for five to six hours a day. During the competition season he is on a high protein diet with near-zero carbohydrates: 60 egg whites, two kg of boiled chicken breasts, and a dozen or so apples. He also takes an array of nutritional supplements— whey protein, a derivative of milk, and amino acids like albumin and glutamine— that help the muscles to recover after a heavy workout. His army job pays Kamaraj Rs 19,000 a month. Sachin Wankhede, a senior lecturer in microbiology at a Pune medical college and avid bodybuilder himself, was more forthcoming. “Steroids are a short route to success,” he said. Once a bodybuilder starts using steroids it is easy to get hooked on. But steroids can lead to liver toxicity and cancer, he warned. They can affect kidney function and deplete calcium level in the bones leading to osteoporosis. Since most steroids are derivatives of the male hormone testosterone, they might decrease the formation of natural hormones and lead to impotency. The monetary rewards of winning a championship can only buy bodybuilders a couple of month’s diet and supplements. Most depend on their families. Nineteen-year-old Raghav, for instance, works as a bouncer in a Chennai pub and hates it when the floor is still wild in the wee hours of the morning. Raghav earns Rs 6,000 a month but spends double the amount on his body with support from his father, an employee with the state electricity board. His biggest hope is to win a national-level championship that would assure him a job in either the railways or the military services under the sports quota. Beyond the hopes and hardships of professional bodybuilding lies another world. At a dimly lit room in Delhi’s Jamia Nagar, metal rods clank and sweat drips out of holes in yellowing vests. At Unique Gym, a 30-year-old comes to regain his lost youth. A school dropout comes to become a “man”. 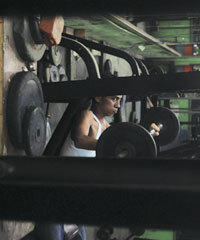 Nazim Chowdhury, 28, grimaces as he lifts hundred-odd kilos. He thinks weights are necessary for doley sholey (bulging muscles); jogging only makes one lean and thin. Naushad Alam, 30, lights up after his namaaz. He is back at Unique after 10 years. He had given up on building muscles to make a living. With his small business of making steel gates doing well, Naushad manages to spend Rs 5,000 every month on his diet. “I need another two years to see if I stand a chance under the spotlights,” he says before vanishing into the dark. Unique downs its shutters at 10 past midnight. Until tomorrow.